Negerhosen2000 is a project spanning various forms and materials. 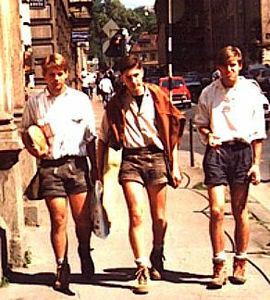 The artist in German Lederhosen constructed of leather resembling caucasian skin and blond hair, was initially deployed as an art-action in multiple European cities. A photographic record/documentation was collected and assembled from the public and incorporated into artworks in the form of private and public art installations, limited edition C-Prints, beer coasters and so on. These images were redeployed in everyday venues such as city squares, bars, restaurants, cafes, beer-gardens , galleries and museums. Tracht as defined on Wikipedia (Traditional folks-apparel is known generically as Tracht ,pl. Trachten). Lederhosen (Leather pants) are particular to the germanic regions of Europe. Sepplhose is a bavarian term used for short length Lederhosen popular in post war life in germany due to its economizing of leather.